Faced with inferior alternatives at home, Canadians who like to gamble on sports are sending billions of dollars each year to offshore, online bookmakers who offer the betting options — and the action — they crave. Editor's Note: This is the first in a three-part series of stories on sports betting in Canada. Life is good this morning for Steve (not his real name). He sits at his computer, like most days, checking the outcomes of the sports bets he made the night before. And he likes what he sees. Steve put a few hundred dollars on two NBA games and won both bets. The San Antonio Spurs comfortably covered the point spread (winning the game by more than the oddsmakers predicted) and a late basket by the hometown Raptors gave him another victory against the spread. It's all part of his morning routine, usually sandwiched between making coffee and taking a shower. 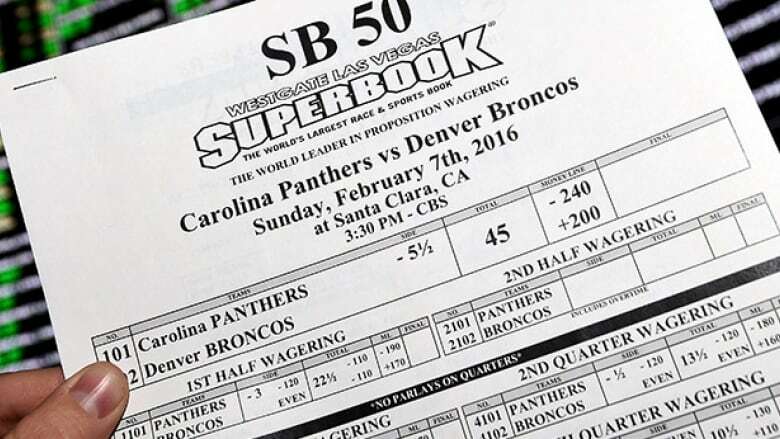 "I wake up in the morning and I check the [betting lines for upcoming games] immediately," he says. "I check Twitter to see if there are any injuries. I do my research." As the evening rolls around and a new set of games begins, Steve is enthralled by the action. "When 7 p.m. hits," he says, "I feel alive." Contrary to the image a phrase like that might suggest, Steve is a busy, successful criminal lawyer in Toronto. While sports betting occupies a fair share of his leisure time, he doesn't see it as an addiction or a problem. To him, it's akin to investing or buying stocks — a market that can be studied and manipulated for profit. And he says his level of commitment to his hobby is common in his professional and social circles. "Every single one of my friends that I'm close with has at one point or another had an account [with a gambling website]." Most of those gambling sites are not based in Canada, but rather offshore, in places like Antigua, Gibraltar, the Isle of Man or the United Kingdom. That may sound shady, even reminiscent of the recent Panama Papers scandal, but the activity Steve and his friends are a part of is not technically illegal in Canada. Anybody with an internet connection and disposable income can easily place bets with the countless offshore bookmakers who court customers in Canada and other countries where it's not legal to accept wagers. "There have been no prosecutions that resulted in convictions or guilty pleas, so the offshore sports books look at Canada as a grey zone," says lawyer Michael Lipton, a gaming law expert with Dickinson Wright in Toronto. Why has the Canadian government chosen to mostly turn a blind eye to internet betting? Gambling has traditionally been the responsibility of the provinces, which have overseen lotteries and brick-and-mortar casinos within their borders. Most of the hundreds of websites offering casino and sports betting to Canadians exist in exotic international locales far beyond the provinces' jurisdictions. And the federal criminal code offers little guidance when it comes to internet gambling. "The criminal code was written decades ago, and these provisions with respect to gaming were drafted in the 1960s and haven't really been updated since," says lawyer Chad Finkelstein, a gaming law expert who has advised casino operators. "These provisions were not drafted with anything remotely resembling the internet ever contemplated. So we have outdated, antiquated provisions, which makes it difficult to apply to a modern gaming business." That, Finklestein says, may explain why no offshore operator has ever faced prosecution for offering casino games or sports wagering to Canadians. As a result, he says, most internet betting companies either assume their service is legal in Canada or at least believe it's unlikely they'll ever be prosecuted. "If anybody tried to shut them down, [online bookmakers] are relying on the possibility they can't be held liable in Canada since there isn't a real and substantial connection between their offshore entity and Canadians who happen to access it," he says. Gamblers too have largely been left alone to enjoy Las Vegas-style sports betting from the comfort of their own homes. Most are able to deposit and withdraw money to and from their online betting accounts using major credit cards and/or their accounts with big Canadian banks. A statement from the Canadian Banking Association, which counts Canada's five largest banks among its members, says "laws vary by province but, in general, many forms of online gaming are legal in Canada. Banks do reserve the right to prevent transactions... if they believe that the client is using the account for illegal or fraudulent purposes." The statement adds that, in some banking agreements, "online gaming transactions are listed as the types of transactions that may be prohibited. Banks will determine what transactions to allow in client accounts based on the laws in the jurisdictions where they operate and their own business policies." Even if some customers encounter a roadblock from their bank, that's hardly a real deterrent with the existence of third-party companies that act as middle men, accepting money from bettors' bank accounts and transferring it instantly to their betting accounts. "I've been [betting] on the same site for the last 20 years. I deposit [funds] either by credit card or through a third party. I have never had any problems whatsoever," Steve says. "And my winnings go directly into my bank account, a big Canadian bank. "There was a time when my credit card wouldn't work, so I used online vouchers, just one extra step, takes 10 minutes. So literally within seconds I can have money in my account." It's no wonder internet betting sites are eager to tap into one of the world's most lucrative gambling markets per capita. Lipton says Canadians make up a "fairly significant chunk" of online bookmakers' customer base — "as much as seven or eight percent in the low end to 13 or 14 per cent in the high end." In actual dollars, that chunk is huge. The amount of money flowing offshore, wagered on a myriad of professional and amateur sporting events by gamblers like Steve (who says he invests an average of $10,000 a year) is truly staggering. Canadians wager an estimated $4 billion a year via offshore sports books located in Europe or other parts of the world, according to Paul Burns, vice president of the Canadian Gaming Association. "In contrast," he says, "they spend about $500 million on provincial sports lottery games" such as Ontario's Pro-Line. Burns estimates billions more are wagered on Canadian soil when you take into account bets made between friends or with illegal bookies, some of whom are tied to organized crime. And yet, online betting remains essentially ignored by Canadian authorities. In a nation obsessed with regulation, billions of dollars flow out of the country every year to offshore entities that do not pay any taxes to our government off the business they generate from Canadian citizens. Imagine if governments chose not to collect the mounds of revenue associated with regulating and taxing cigarette and alcohol sales? Or the lottery. "I think it's a very large source of potential revenue for the government," says Lipton. "At the same time it also highlights the fact that the existing regulatory framework does not work anymore, and it's about goddamn time the government looks at this and thinks about how they can change it." Part 2 of our series on sports betting in Canada examines why gamblers turn to offshore bookmakers rather than bet with their provincial sports lotteries, and how efforts to change the current system could impact all Canadians — whether or not they gamble.